The 1 of 6 XP1 LM is a downforce monster. 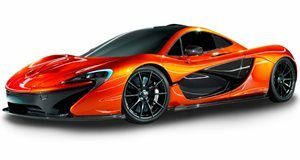 The Mclaren P1 is automotive excellence, and just when we thought it couldn't get better, along came the track only P1 GTR. Surely that would be the best of the best? Alas not, as we were recently introduced to the next level - the McLaren P1 LM, basically the P1 GTR but made ready for the street, perfect for the billionaire who wants to show off while fetching milk. The conversion was carried out by , who lightened the car with more carbon and added a large rear wing, actually massive is a more apt word. The P1 LM still has 986 hp available from the 3.8-liter twin-turbo hybrid setup, but it's reportedly 132 pounds lighter, and lighter equals faster. The to much praise, and since then we've been . After that, we're hoping McLaren, or at least Lazante, will release a lap time. Well, Supercarsfromeu just spotted it at the famed track with a full race crew in tow. We now believe this to be the final incarnation before the other 5 will be built. As you can see from the way the XP1 LM pulls away from the other cars that let it pass, it's a properly rapid machine. We're keeping an eye out for an official video and lap time, which should be one of the quickest production cars seen at the Ring. We like the unpainted version, but the 5 painted cars should be just as hot.